With a custom engineered aerial grid, wide open room, and industry standard safety mats; Iowa Fly Girl Academy is Iowa's premier facility. Located in the heart of Downtown Des Moines inside of the Des Moines Social Club, we are a 15 minute drive from any DSM suburb! This is where it all begins! No experience necessary, just a desire to FLY! Lyra and Silks and Hammock Oh MY! Try out all the apparatus in this class! After completing All Aerial 1, take your skills to the next level with All Aerial 2! Beginning with the basic skills, this class will build your strength, showcase flexibility, all while you’re learning flipping, turning, rolling, posing, and transitioning positions on this beautiful aerial apparatus. 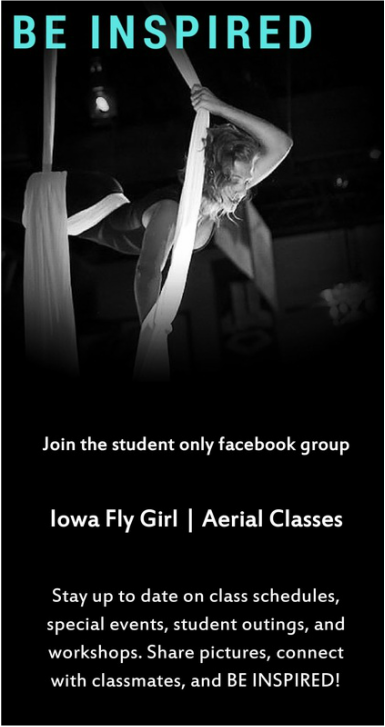 This Iowa Fly Girl original class will take your aerial skills to new heights! In this class we will put skills you already know into a choreographed routine! Aerialography focuses on musicality and flowing tricks and poses together into beautiful routines. This is essential for aerialists development and growth! A 60 minute conditioning class that will give you the sensation of flying while strengthening and lengthening your body through aerial acrobatics, body resistance, and strength, balance & core training. You will learn circus skills like, Trapeze, Aerial Silks, and Hand-balancing while you enjoy a fun and exciting way to get in shape and maintain strength, flexibility and coordination! Circus Circuit is a fun-filled experience for men and women of all fitness level. This class is designed to increase flexibility needed to prevent injuries and advance your existing aerial practice or can be nice way to ease into aerial. We use a variety of aerial apparatuses including aerial fabric, hammock, trapeze, and lyra (aerial hoop) to enhance your flexibility and take it to the next level, using active and static stretches. Aerial Silks 2 is a progression of the silks you learned in Aerial Silks. We will start working moves a little higher up and begin advancing the poses and tricks. Don’t worry though; skills are customized for your strength and skill level. There will be a strong emphasis on ideal body alignment and form along with building more strength and flexibility. Successful completion of Aerial Silks and approval from a DMSC aerial instructor are required. You will be redirected to a webpage to book your desired date after checking out. Take classes with the Iowa's first aerial instructor! Felicia has taught hundreds of men, women, and children from ages 2 to 65! Anyone with a desire to fly can try aerial. For fitness or just for fun, there is something for everyone! Learn to climb to the top of an aerial silk or rope, swing from a trapeze, spin on a hoop, and feel the thrill of inversion on a hammock. Felicia is available to teach workshops or classes all over the state of Iowa and can travel further for larger events. She is also available for private and semi-private training sessions. You can come to the Iowa Fly Girl Training Center or Felicia can come to your studio/venue. You don’t have to be fit to start aerial training. I start you out with the basics, which is on the ground and we build from there; eventually getting you flying. You will be amazed at how fast you build strength and how a trick gets a little easier each time you practice it. In class, Felicia focuses on helping students establish good fundamental technique, working on step by step progressions, and confidence building. Safety is #1! Felicia is CPR, AED, and First Aid certified. She continues to travel all over the country training with industry leaders to ensure she is qualified in the latest techniques and safety standards. Drop in rates are $10-$20 depending on type. Discounts applied to full sessions. Q: I've never done dance or gymnastics or anything like this. Do you think I can do aerial? A: Guess what? Neither have I. EVER. I have had no formal training of any kind aside from aerial, which I didn't start until my early twenties. So YES you can do this. Q: Are your students young? I think I'm too old for this. A: My eldest student is pushing 70 years old. This isn't for everyone, or everyone would do it, but age is no excuse here. A: My aerial equipment and structure is rated at over 900 lbs. However to be safe there is a weight limit of 400 lbs. Q: What should I wear for aerial classes? A: You want to protect your skin from rope/fabric burns, so the more overage the better. At minimum you need your waist, arm pits, and knee pits covered. I recommend leggings and a form fitting t shirt. 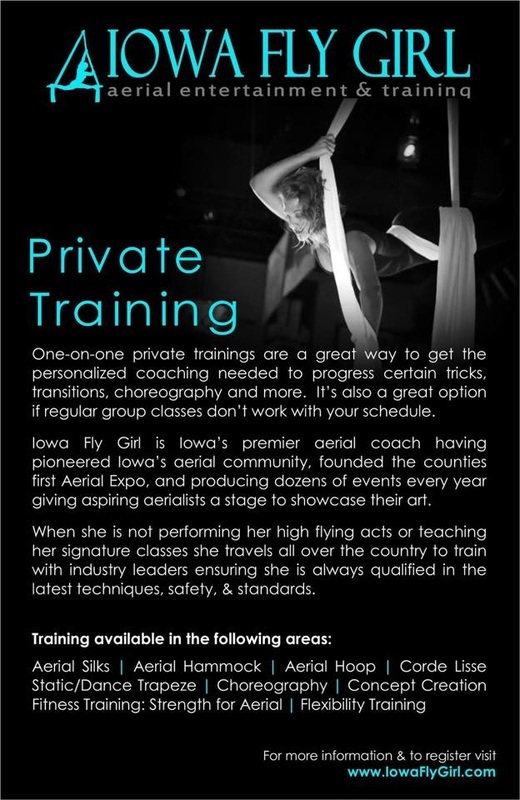 Take aerial fitness classes in Des Moines, Iowa with Iowa Fly Girl. Iowa's premiere Aerial Art coach. Aerial Silks in Des Moines. Aerial Yoga in Des Moines. Aerial Hoop in Des Moines. Aerial Art in Des Moines. Aerialist in Des Moines. Circus in Des Moines. Aerial Hammock in Des Moines. Cirque in Des Moines. Aerial Tissue in Des Moines. Aerial Training in Des Moines. 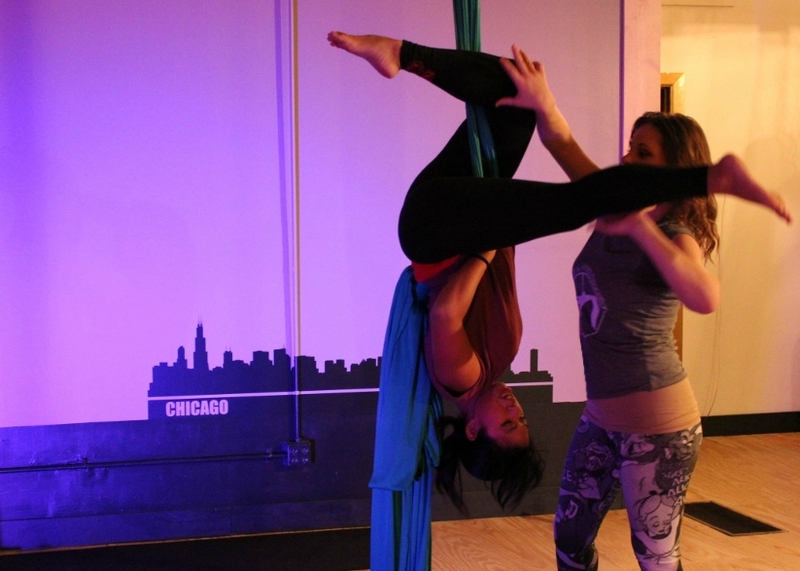 Aerial Classes in Des Moines. Circus Art in Des Moines. Aerial Fitness in Des Moines. Yoga in Des Moines. Flexibility in Des Moines Flexibility Training in Des Moines. Contortion in Des Moines. Contortion Training in Des Moines Contortion Classes in Des Moines. Circus Classes in Des Moines. Aerial Silks in Iowa. Aerial Yoga in Iowa. Aerial Hoop in Iowa. Aerial Art in Iowa. Aerialist in Iowa. Circus in Iowa. Aerial Hammock in Iowa. Cirque in Iowa. Aerial Tissue in Iowa. Aerial Training in Iowa. Aerial Classes in Iowa. Circus Art in Iowa. Aerial Fitness in Iowa. Yoga in Iowa. Flexibility in Iowa Flexibility Training in Iowa. Contortion in Iowa. Contortion Training in Iowa Contortion Classes in Iowa. Circus Classes in Iowa.